So Peyton has entered the stage where she doesn't really take too kindly to other people. At school, she prefers a few teachers. At home, she may say hi to you if you come to visit, ignore her for the first 30 minutes and you're lucky. Most of the time she doesn't like anyone paying too much attention to her though. She prefers me most of the time but if any other member of our family (Tom and Austen) leave the house or so much as walk on a different side of the street, she let's us know she doesn't like it. What do they call this separation anxiety? 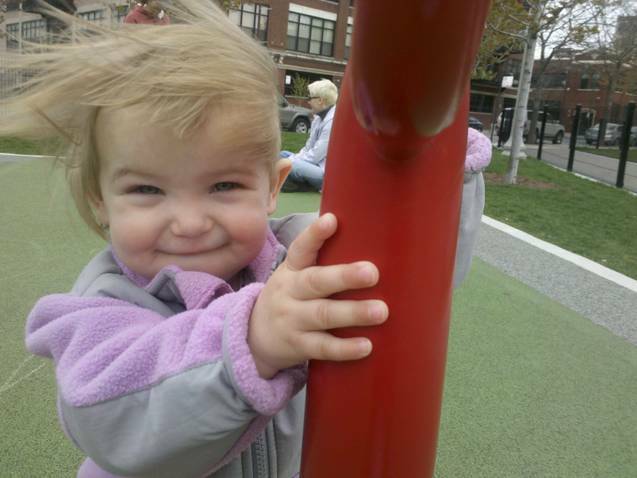 I hope it passes quickly because as cute as it is that she prefers me it certainly is going to get old fairly quickly. As of today she's 17 months so she's almost entering the time when Austen was at his worst (18 - 21 months) and we didn't bring him to a restaurant for three months after he slipped through the outside eating area fence and almost ran into the street. I feel like we are wiser parents than we were then but I'm sure she will challenge us in different ways. Already she so wants to communicate with us. She understands directions remarkably well. You can tell her to go recycle something and she heads toward the back door or to put her play food in the blue basket and she does so. And, she repeats words rather well. She likes to say animal, dog, Adler, ball and her newest...football. She still loves to read her books and will sit down and go page by page through them. She has just started showing an interest in dolls too. 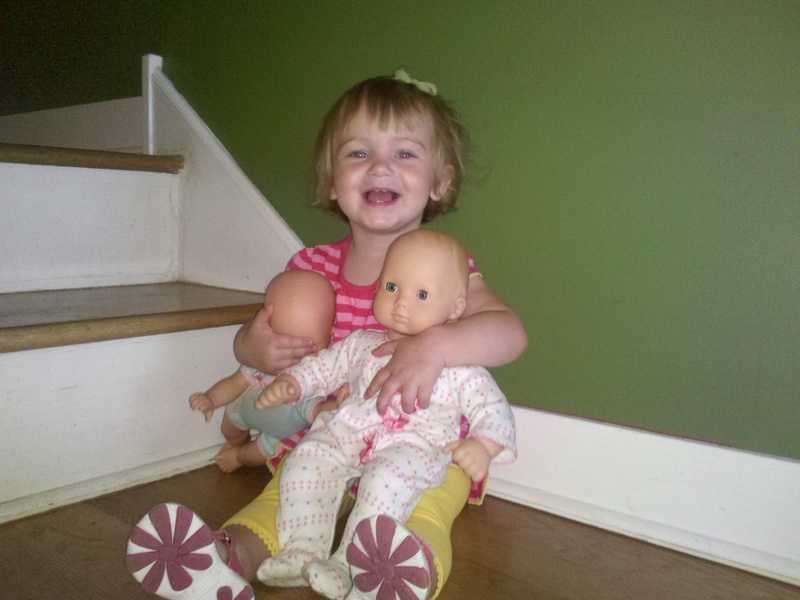 She likes to carry around her babies, put them in the stroller and push them around. And, she really loves to play with Adler. She's excited to see her first thing in the morning and often goes over and gives her a kiss or brings her a toy. I think she's going to be my animal lover but for now she's a mama's girl. Dolphins, Jellyfish and Crabs...Oh My! We just returned from a week long vacation on Folly Island in South Carolina. Last year, I read about this beach town on Yahoo as one of the best beaches and thought we'd try it out. It didn't disappoint. This sleepy beach town had the perfect surf, beach and the chain stores hadn't infiltrated it yet (i.e. Starbucks). We drove the 15 plus hours so we could even take Adler on vacation. We left in the afternoon on a Friday and broke up the drive into two days. Let's just say, Adler was great. I often said to Tom, I'll take three of her any day! Here's a little snapshot of our trek out there. We rented a house on the beach and the views were amazing. There's nothing like waking up every morning and seeing the ocean. In fact, there's nothing like seeing it from all parts of your house even the shower! In the morning we saw dolphins swimming. We also saw pelicans, crabs and Austen learned about jellyfish. There was also sand dollars lining the beach and many seashells to be picked up. Austen learned to boogie board (brought back some memories for me) and Peyton learned how to build sand castles. The way home was easier than the way there. The kids were great. We lunched at a rest area in the Smoky Mountains. Austen made friends with another boy picnicking there with his family. And, Peyton liked the dad and decided she was going to go sit in his lap! All in all, it was a great week. And it makes me recall all the beach time I put in on the Atlantic. I am happy my kids will experience a piece of that even though they're from the Midwest. 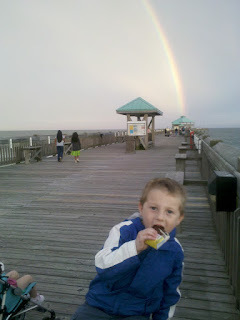 Austen saw his first rainbow on Saturday. Actually it was a double rainbow. He has been learning a lot about rainbows lately. Mainly how to draw them and which colors come first but he's pretty good at knowing the order. So it was pretty good timing when we happened to see a rainbow. Getting Austen to look in the sky and try to find the faint rainbow was a little challenging at first but once he spotted it he held onto it and followed it as it became a full rainbow and became brighter and brighter. The best part was that a second full rainbow appeared on the outside of the original rainbow. It was definitely a once or a twice in a lifetime moment. And it was great to share it with Austen although I'm not sure he'll remember it! Mother's Day started early for me. Peyton's class had an outing at the park for all the moms and they gave each mom a mold with the hand print of her child. Then Sunday came and the sun was shining giving us a day's reprieve from the normal downpours we've been having lately. That was perhaps the best gift of all because we started the morning with a long walk outside with Adler. Of course this was after Peyton decided to bite her brother. Yup, he was minding his own business with his arm on a chair waiting patiently for me to finish adjusting his pants. Peyton was there too and determined her brother was blocking her from getting on the chair so without so much as a warning she opened her mouth and sunk her teeth into his arm. Now I am no stranger to biting toddlers. Austen was a horrible biter so for some reason I thought I'd be spared another biter. Not so. I have gotten three notes from school in just two days that she has bit her friends too. I feel the lemon juice coming on! That was the only way I got Austen to stop biting. Anyway, my two kids and dog surprised me with a new iPod Nano since my mini was so terribly out of date (compliments of my husband). I didn't even recognize it since it's so small but I am looking forward to using it on my treadmill which has the plug in for an iPod. We rounded out the day by heading to the burbs to honor more moms and enjoy the sunny day. Happy 4th Mother's Day to me. When I was about 12, we had a day off from school. My dad decided he was going to take the day off too and spend some time with my brothers and me. So he piled us into the car and didn't tell us where we were going. We knew even at that age and having recently moved to Illinois, that we were going downtown so we were giddy thinking that our dad was taking us to the Cubs game. That dream ended when my dad got lost and had to ask a cop where the Museum of Science and Industry was located. My brothers and I were so not thrilled so when my dad exited the car, we locked ourselves in (this was before the days of car remotes). Twenty plus years later, I still remember that day and how bored I was. Science isn't my thing although I have to say that I have been back to the Museum of Science and Industry at least two or three times since then and wouldn't write home about any of those times either so I don't know why I reluctantly agreed to attend when Tom wanted to bring Austen and Peyton there. But, I did. Austen enjoyed the model train railroad and Peyton liked looking at all the people. And, I liked zipping through all of it in less than two hours.